Today would be the 108th Birthday of Dr.Seuss. His philosophical children's book, Yertle the Turtle, inspired this lunch. Unable to find a ready made turtle cutter, I made my own with my hubby's help from what was once a bell shape (used pliers to reshape). Checkerboard pattern grapes and cantaloupe. Below is pix of the cutter. 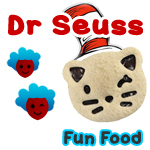 Want to see more Seussical themed lunches? Click to check out the next one from Corey at Family Fresh Meals! 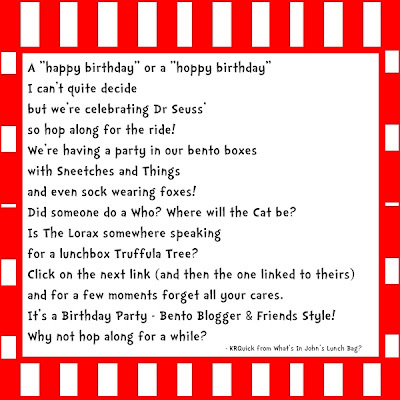 Keep celebrating Dr. Seuss' birthday by hopping through the rest of the Blog Hop! SO cute Rina! :) I love turtles and yours turned out great! Great turtles! Very clever of you to reshape an old cookie cutter. Pretty clever mommy! The turtles came out great!! Super drawings on top as well! Bravo! Cute turtles, I love them. And wow, great job to reshape the old cutter. What a great idea to make a new cutter out of an old one!!! Now my brain is working in overdrive trying to think of what I might be able to mangle ;) SUPER cute lunch! LOVE, and how fabulous that you made your own turtle cutter, so creative!!! You are so handy with that cutter, great job! Great turtles great custom cutter! Yertle the Turtle is one of my favorite Seuss creations. Amazing job on this lunch! Wow, love that you made the cuuter and the turtles came out so great! Love the Yertle bento, andf wow, way to go making your own cookie cutter! Candy Girl, thank you so much for your kind comment :) I will be thinking of which cutter to recycle from now. I love it Rina! Great job on those turtles! Cute! Cute! I love that people selected books that weren't just your typical ones! Great addition! Voting has opened for your favorite reptile! Awe Yertle! That pick is so cute too! I love that you created your own custom turtle cutter! Such a cute lunch! The fact that you made the cutter yourself makes it extra amazing!